Honeymoon Guesthouse is a charming Bali-chic oasis that offers an authentic Balinese experience with a touch of elegance and tranquility.Enter hand-carved stone gateways and immerse yourself in Janet DeNeefe’s world (quite literally as it’s her family home). You might bump into her as you explore the grounds, take a dip in the pool or tuck into your breakfast. For a unique, first-hand opportunity of the culture, guests are welcome to join in-house ceremonies and special cultural events. 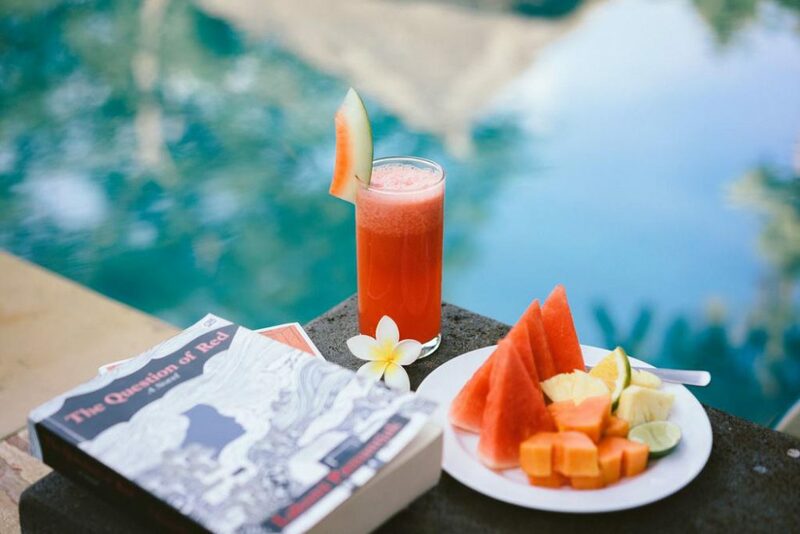 During the Ubud Writers & Readers Festival you might brush shoulders with an award-winning author staying on the property. Anything is possible! Pamper yourself with a massage in the privacy of your own room, chill out with a frozen margarita at the bar, dine on local fare at the Honeymoon Kitchen, take a cooking class, hang out at the salt-water pool, join yoga in the onsite studio or delve into the Honeymoon Library and catch up on some reading.